Similar "strange coincidences" have happened before. 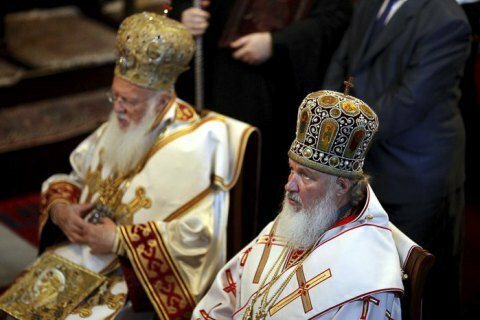 There are serious concerns that Constantinople Patriarch Bartholomew may be physically eliminated, which may stall the process of granting autocephaly to the Ukrainian Orthodox Church for many years, theologist Oleksandr Sahan has said in his blog hosted by LB.ua. He recalled that similar "strange coincidences" had already happened in the history of church politics. Since the Kremlin strategists never lost sight of the "Orthodox" issues, because of their efforts the process of signing and delivering the Tomos to Ukrainians in Poland in 1924 had taken two years and four (!) patriarchs of Constantinople. Two of them were forced to abdicate, and one, who was a healthy man, suddenly died three days after the Tomos was signed due to acute heart failure. His successor brought himself to publicize the finished document in almost a year because the situation around the Tomos was confusing and dangerous at that time. Given this historical "experience", the statement by a Moscow Patriarchate official, Metropolitan Ilarion Alfeyev, about a possible bloodshed in case the Tomos is granted is being perceived very seriously. Besides, there have been fake news stories about the allegedly deteriorating health of the Ecumenical Patriarch. "Considering these circumstances, there should be serious concerns about the physical elimination of current Constantinople Patriarch Bartholomew, which may stall the process of granting autocephaly to the Ukrainian Orthodox Church for many years. And therefore an interested party may have a stronger temptation to seize this opportunity," the expert warned. "Therefore, we must realize and appreciate the personal courage of Patriarch Bartholomew, who does not fall for multi-faceted blackmail by the Moscow Patriarchate and Moscow secular diplomacy, continuing his course for recognising the Ukrainian Orthodox Church," Sahan added. He hopes that "those responsible for Bartholomew's security are aware of the seriousness of threats to his life, which have now actualized directly and indirectly."